but many food items consist of very less sugar. 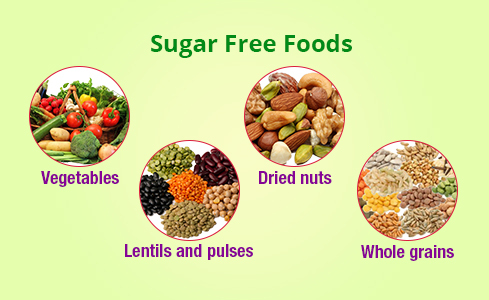 Such foods are helpful in maintaining blood sugar levels and reduce weight. 1. Vegetables: Vegetables low in starch contain extremely less or no sugar. People intending to maintain blood sugar levels can eat these vegetables freely without any limitations. A list of such vegetable includes cauliflower, cabbage, cucumber, celery, spinach, fenugreek leaves (Methi), mushrooms, bell-peppers, ridge gourd, bottle gourd, bitter gourd, celery, broccoli, and brinjal. 2. Lentils and pulses: Lentils and pulses are a rich source of proteins which are low in sugar content as compared to the non-vegetarian sources. According to Ayurveda, whole moong are highly recommended for diabetics. Other lentils, which are low in sugar content are moong dal, toovar dal, and choli beans. 3. Dried nuts: Dried nuts like almonds, walnuts, pine-nuts, and pistachios are considered very good snacks for sugar conscious people. While nuts are low in sugar, they provide ample amount of good fat, fiber and magnesium. Considering the fat content of nuts, it is crucial to maintain their amount in routine diet. 4. Whole grains: Whole grains are a rich source of fiber and many essential vitamins. As compared to processed grains, they are low in starch content and thus maintains blood sugar levels while providing enough energy. Some examples of whole grains are brown rice, ragi, jowar, bajra, and durum wheat. Ginger is Hot if You've Got A Cold! What is Your Thirst Telling You? Coffee: What's the scoop on its health effects?